Garden Air - What Does Air Have To Do With Gardening? Garden Air – What Does Air Have To Do With Gardening? Organic Gardening Goal 5: To optimize garden air quality and circulation in the soil, water and atmosphere in support of all life forms. Plants are over 50% air. According to one source, they’re about 44% carbon, most of which comes directly from the air. They’re about 44% oxygen, which comes from the air and from water. And they’re 1-4% nitrogen, which comes from the air. So your garden air is important for your plants. In Weeds, Control Without Poisons by Charles Walters, he claims that weeds are more like 80% air when you also include airborne nutrients and cosmic and solar energy. So, plants like fresh garden air just like we do. While some plants are pollinated by birds, insects and other animals, all conifers and grasses and many deciduous trees rely on wind for pollination. That’s how they mate. Many plants also use the wind to spread seed. Garden air in North America contains pollutants that have traveled across the ocean from China. Pesticide spray comes into your garden from 50 miles away. Acid rain – caused largely by us via our vehicles, factories, electricity generation plants, and meat production – is causing environmental problems around the world. 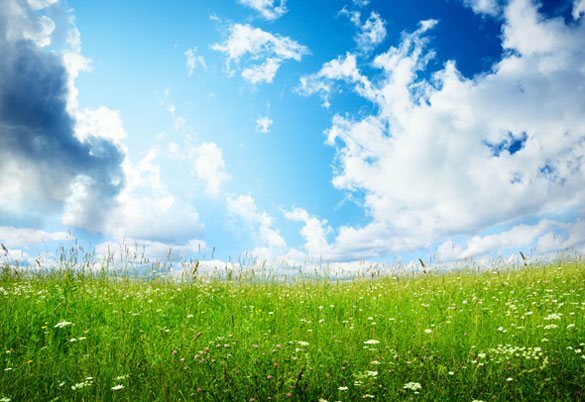 As an organic gardener, garden air quality is important to you. You already know how to decrease above ground air pollution. Drive less. Fly less. Use less power in general. Eat less meat. Don’t burn toxic things. You can buy fancy lightbulbs and front-loading washing machines and all that, but decreasing consumption is number one on the list. In terms of garden air circulation, I should mention one common way that gardeners attempt to increase it that actually is not beneficial for the intended purpose: Pruning. Whether conventional or organic gardening, pruning is often done in disease-prone plants such as fruit trees with a goal of increasing air circulation to diminish the conditions that promote disease. The fact is that trees have been around for a lot longer than us and they actually know how they want to grow. If they have disease, it’s because they are nutritionally deficient, not because they somehow messed up and grew too many branches. But I guess that’s for another article. It does, however, make sense to think about garden air circulation across your property when you are designing your organic garden, and place plants and structures in a manner that allows for air movement. That’s good for everybody. Our friends in the soil need air, too. Most of the helpful bacteria and fungi are “aerobic”. They need air just like us. So do plant roots. A healthy soil is made up of approximately 25% air! This is not achieved by us rototilling or aerating the soil. In fact, that destroys the soil structure. Proper garden air in the soil is achieved by the hard work of the microorganisms, insects and earthworms building themselves cities. Our only job is allowing them to have the tools they need to do this. Food – Leaves, grass clippings, dead squirrels, compost. Drink – Water, hot chocolate (when they’ve been good). Not too much water, though. Safety (a lack of chemicals and rototillers and compacting equipment is generally appreciated). Organic gardening is pretty easy, right?